• "I started following the keto diet because I've read that I can lose weight and lower my blood glucose quickly." • "I've been reading how people can reverse or cure their prediabetes or type 2 diabetes if they eat very low carb, like 30 g a day." • "I don't want to follow the American Diabetes Association (ADA) diet. People say its high carb, and people with diabetes should eat low carb to stay off of or use less medication and keep their glucose levels under control." The promise of low-carbohydrate diets to control blood glucose or facilitate weight management has been popular in waves for decades. The ebb and flow of diet trends slenge dietitians because they know the importance of evidence-based practice. However, to work successfully with clients, it's critical to remain person centered and meet each one where he or she is. 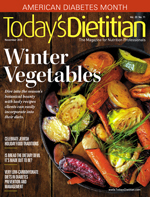 This article offers an overview of the various low-carbohydrate diets, a brief review of recent studies on these eating patterns in the prevention and management of type 2 diabetes, and practical advice for RDs and their clients. • high-carbohydrate diet: >65% of kcal as carbohydrate per day. Debates about these diets among health care providers and people with diabetes and their caregivers can be polarizing. Some very low-carbohydrate diet proponents mistakenly refer to the ADA nutrition recommendations as "high in carbohydrate." The ADA nutrition recommendations—last fully reviewed, revised, and published in 2014 and updated annually—say there's no ideal percentage of calories from carbohydrate, protein, and fat for all people with diabetes; therefore, macronutrient distribution should be based on an individualized assessment of current eating patterns, food preferences, and metabolic goals.1,2 Presently, the ADA nutrition recommendations are undergoing revisions for publication by mid-2019. Following are some of the more recent findings from studies on the impact of very low-carbohydrate diets. • Hallberg and colleagues conducted an open-label, nonrandomized, controlled before-and-after one-year study of the Virta Health continuous care intervention (CCI) and usual care (UC) models.14,15 The CCI group included intensive, digitally enabled support with access to medical providers, health coaching, nutrition and behavior change education, individualized care plans, biometric feedback, and peer support via an online community. Participants were given individualized nutrition recommendations to achieve and maintain nutritional ketosis with a goal of 0.5 mmol/L to 3 mmol/L of blood serum beta-hydroxybutyrate (a ketone body). Subjects typically required carbohydrate intake to be less than 30 g per day to achieve nutritional ketosis. The UC group included self-selected participants receiving care from their medical providers. RDs counseled them on diabetes self-care, nutrition, and lifestyle in accordance with ADA Standards of Care.2 The study enrolled 262 adults with type 2 diabetes in the CCI arm, which 218 (83%) completed; 87 were enrolled in the UC group and 78 (90%) completed. After one year, people in the CCI lowered A1c from 7.6% to 6.3%, lost 12% body weight, and reduced use of glucose-lowering medication. The UC participants experienced no changes in A1c, weight, or medications. CCI participants improved dyslipidemia, liver function, and inflammation markers. This study lacked a control group, making it impossible to differentiate between the effect of the ketogenic diet and intensive support on outcomes. • Tay and colleagues conducted a randomized controlled trial to explore whether an energy-restricted, low-carbohydrate (defined as 14% of daily kcal), high-unsaturated/low-saturated fat diet compared with a low-fat, high-carbohydrate (53% of daily kcal), low-glycemic index diet with a physical activity component improved glycemic control and CVD risk factors in overweight and obese people with diabetes over two years.12 Researchers randomized 115 adults, average age 58, with a mean BMI of 34.6 and an A1c of 7.3%. They assessed A1c, glycemic variability, antiglycemic medication effect score (calculated based on potency and dosages), weight, body composition, CVD risk markers, and renal risk markers before and after intervention. Only 61 (53%) of the 115 participants completed the study. Results showed comparable weight loss and A1c reductions in the two groups. Subjects in the low-carbohydrate group experienced greater reductions in use of glucose-lowering medication, and improvements in diurnal glucose stability and lipid profile with no adverse renal effects. The study findings suggest that a low carbohydrate intake better optimizes type 2 diabetes management. • The randomized controlled trial by Gardner and colleagues demonstrated that there's no difference between the effects of a healthy low-fat (HLF) diet and a healthy low-carbohydrate (HLC) diet on weight loss.16 Researchers in this 12-month study of overweight adults without type 2 diabetes examined whether three single-nucleotide polymorphism multilocus genotype responsiveness patterns or insulin secretion after a glucose challenge were associated with weight loss. Six hundred and nine adults (~300 people in each group) aged 18 to 50 with BMIs between 28 and 40 participated. Retention at one year was 79%. Mean 12-month macronutrient distributions between the two diets (HLF vs HLC) were carbohydrates: 48% vs 30%; fat: 29% vs 45%; and protein: 21% vs 23%, respectively. Weight change at 12 months wasn't significantly different. Participants on the HLF diet lost 5.3 kg; participants on the HLC diet lost 6 kg. Neither genotype pattern nor baseline insulin secretion was associated with an effect on weight loss and didn't help identify which diet was better for whom. People who want to follow or already are following very low-carbohydrate eating plans may be more focused on glycemic control and weight loss rather than on the role a more balanced eating plan has on their general health, diabetes, and chronic disease prevention. Long-term studies on type 2 diabetes prevention show that people at high risk of prediabetes or who already have prediabetes can consume a healthful eating plan consistent with the 2015–2020 Dietary Guidelines for Americans, get adequate physical activity, achieve at least 5% weight loss (and maintain the majority of it), and prevent or delay type 2 diabetes.17,18 And they can achieve these goals, especially if they're enrolled in programs such as the National Diabetes Prevention Program (DPP) or Medicare DPP. Research also shows that people with type 2 diabetes who achieve minimal weight loss and maintain it and implement other healthful lifestyle practices early in their diagnosis can slow disease progression.1 In fact, research demonstrates that losing weight on eating plans that contain a wide range of macronutrients early in the disease process can have powerful metabolic effects.1,2,7,8 People who have had type 2 diabetes for years may not see similar results with very low-carbohydrate diets or other weight loss plans due to their insufficient insulin production, not because of poor adherence to these eating plans. It's important for dietitians to inform clients that people with diabetes have two to four times the risk of CVD, nearly three-quarters have hypertension, and their risk of developing certain types of cancers is higher.19-21 Achieving and maintaining metabolic goals is critical to managing, preventing, or delaying these and other comorbidities and complications.1,2,7,8 The body of research on preventing diabetes-related chronic diseases also supports the benefits of a plant-based eating pattern.22,23 However, the ketogenic diet has been shown to produce beneficial metabolic changes and advantageous weight loss in the short term.24 RDs should ask clients and others who are interested or are already following a very low-carbohydrate diet whether they have preexisting renal disease and CVD, both of which may be a contraindication for these eating plans. Very low-carbohydrate diets minimize available glucose, the body's primary and main source of fuel. However, on these diets, ketone bodies become a major source of fuel.24 And while people can, with appropriate guidance and support, consume more healthful sources of protein and fat, some don't and may increase consumption of unhealthful saturated fats. Lastly, very low-carbohydrate diets can be challenging to follow consistently over time. Long-term sustainability can be difficult for some because these eating plans are inconsistent with the way most Americans eat at and away from home. The majority of people at risk of or who have type 2 diabetes are overweight or obese.1 Research and recommendations underscore the value of losing at least 5% of body weight and maintaining as much of that weight loss as possible. To date, there's no magic formula, pill, or potion to lose weight and keep it off. Losing weight is challenging, and keeping pounds off can be more so. Research shows that people who attempt to follow eating plans far from their usual preferences and patterns typically go back to their lifelong eating style and habits.25 So it's important to work with clients collaboratively to prevent or manage type 2 diabetes through a slow and steady process of making small lifestyle changes. Short-lived or temporary quick fixes usually aren't sustainable. However, for some, a jump start with a very low-carbohydrate diet may be helpful. There always will be the next latest and greatest diet being touted to the public. So it's important for dietitians to stay abreast of the latest research and evidence-based recommendations to help clients sort out fact from fiction. However, this must be balanced with person-centered care and the support of clients to achieve their health and nutrition outcomes over time. — Hope Warshaw, MMSc, RD, CDE, BC-ADM, FAADE, owns Hope Warshaw Associates, LLC, a diabetes and nutrition focused consultancy based in Asheville, North Carolina. She's the author of numerous books published by the American Diabetes Association including Diabetes Meal Planning Made Easy and Eat Out, Eat Well — The Guide to Eating Healthy in Any Restaurant. Warshaw served as the 2016 president of the American Association of Diabetes Educators and currently serves on the board of the Academy of Nutrition and Dietetics Foundation. — Toby Smithson, MS, RDN, LD, CDE, CCP, a diabetes lifestyle expert, is a speaker, writer, consultant dietitian, and author of Diabetes Meal Planning and Nutrition for Dummies based in Hilton Head Island, South Carolina. 1. Evert AB, Boucher JL, Cypress M, et al. Nutrition therapy recommendations for the management of adults with diabetes. Diabetes Care. 2014;37(Suppl 1):S120-S143. 2. American Diabetes Association. 4. lifestyle management. Standards of Medical Care in Diabetes — 2018. Diabetes Care. 2018;41(Suppl 1):S38-S50. 3. Wheeler ML, Dunbar SA, Jaacks LM, et al. Macronutrients, food groups, and eating patterns in the management of diabetes: a systematic review of the literature, 2010. Diabetes Care. 2012;35(2):434-445. 4. What's a ketogenic diet? WebMD website. https://www.webmd.com/diet/ss/slideshow-ketogenic-diet. Published February 1, 2017. Accessed June 13, 2018. 5. How it works. Atkins website. https://www.atkins.com/how-it-works/compare-plans. Accessed June 29, 2018. 6. When a carb's not a carb: the net carb debate. WebMD website. https://www.webmd.com/women/features/net-carb-debate#1. Accessed June 29,2018. 7. Franz MJ, MacLeod J, Evert A, et al. Academy of Nutrition and Dietetics nutrition practice guideline for type 1 and type 2 diabetes in adults: systematic review of evidence for medical nutrition therapy effectiveness and recommendations for integration into the nutrition care process. J Acad Nutr Diet. 2017;117(10):1659-1679. 8. MacLeod J, Franz MJ, Handu D, et al. Academy of Nutrition and Dietetics nutrition practice guideline for type 1 and type 2 diabetes in adults: nutrition intervention evidence reviews and recommendations. J Acad Nutr Diet. 2017;117(10):1637-1658. 9. US Department of Health & Human Services. Dietary Guidelines for Americans 2015–2020: Eighth Edition. http://health.gov/dietaryguidelines/2015/guidelines/. Published January 7, 2016. Accessed June 17, 2018. 10. Delahanty LM, Nathan DM, Lachin JM, et al. Association of diet with glycated hemoglobin during intensive treatment of type 1 diabetes in the Diabetes Control and Complications Trial. Am J Clin Nutr. 2009;89(2):518-524. 11. Vitolins MZ, Anderson AM, Delahanty L, et al. Action for Health in Diabetes (Look AHEAD) trial: baseline evaluation of selected nutrients and food group intake. J Am Diet Assoc. 2009;109(8):1367-1375. 12. Tay J, Thompson CH, Luscombe-Marsh ND, et al. Effects of an energy-restricted low-carbohydrate, high unsaturated fat/low saturated fat diet versus a high-carbohydrate, low-fat diet in type 2 diabetes: a 2-year randomized clinical trial. Diabetes Obes Metab. 2018;20(4):858-871. 13. Saslow LR, Daubenmier JJ, Moskowitz JT, et al. Twelve-month outcomes of a randomized trial of a moderate-carbohydrate versus very low-carbohydrate diet in overweight adults with type 2 diabetes mellitus or prediabetes. Nutr Diabetes. 2017;7:304. 14. Virta Health website. https://www.virtahealth.com. Accessed June 17, 2018. 15. Hallberg SJ, McKenzie AL, Williams PT, et al. Effectiveness and safety of a novel care model for the management of type 2 diabetes at 1 year: an open-label, non-randomized, controlled study. Diabetes Ther. 2018;9(2):583-612. 16. Gardner CD, Trepanowski JF, Del Gobbo LC, et al. Effect of low-fat vs low-carbohydrate diet on 12-month weight loss in overweight adults and the association with genotype pattern or insulin secretion: the DIETFITS randomized clinical trial. JAMA. 2018;319(7):667-679. 17. Ely EK, Gruss SM, Luman ET, et al. A national effort to prevent type 2 diabetes: participant-level evaluation of CDC's National Diabetes Prevention Program. Diabetes Care. 2017;40(10):1331-1341. 18. Warshaw H. Guest commentary: type 2 diabetes prevention — a golden opportunity for RDs to engage. Today's Dietitian. 2018;20(8):31-32. 19. Centers for Disease Control and Prevention. National Diabetes Statistics Report, 2017. https://www.cdc.gov/diabetes/pdfs/data/statistics/national-diabetes-statistics-report.pdf. Accessed June 17, 2018. 20. High blood pressure. Centers for Disease Control and Prevention website. https://www.cdc.gov/bloodpressure/index.htm. Updated July 18, 2018. Accessed June 17, 2018. 21. Diabetes and cancer. American Diabetes Association website. http://www.diabetes.org/are-you-at-risk/lower-your-risk/diabetes-and-cancer.html. Updated March 21, 2017. Accessed June 17, 2018. 22. Cancer prevention recommendations. American Institute for Cancer Research website. http://www.aicr.org/reduce-your-cancer-risk/recommendations-for-cancer-prevention/. Accessed June 17, 2018. 23. Collins K. New cancer prevention recommendations explained. American Institute for Cancer Research website. http://blog.aicr.org/2018/05/29/new-cancer-prevention-recommendations-explained/. Published May 29, 2018. Accessed June 17, 2018. 24. Diet review: ketogenic diet for weight loss. Harvard T.H. Chan School of Public Health website. https://www.hsph.harvard.edu/nutritionsource/healthy-weight/diet-reviews/ketogenic-diet/. Accessed June 17, 2018. 25. Sacks FM, Bray GA, Carey VJ, et al. Comparison of weight-loss diets with different compositions of fat, protein, and carbohydrates. N Eng J Med. 2009;360(9):859-873. • Be knowledgeable about and open to the body of evidence on very low-carbohydrate diets to answer clients' questions in a supportive way. • Consider your assessment of clients' nutritional and diabetes status, medical history, food preferences and patterns, and ability and willingness to follow and follow through with a particular eating plan. Based on your assessment, help clients determine whether a very low-carbohydrate diet is a safe and reasonable choice for them. • Stay current with the American Diabetes Association nutrition recommendations, other publications, and the 2015–2020 Dietary Guidelines for Americans. • Clients may or may not have accurate information or adequate knowledge to implement a very low-carbohydrate eating plan; therefore, assessing their knowledge and teaching the basics is important. • Clarify that foods contain (are packages of) varying amounts of three macronutrients: carbohydrates, fats, and proteins (alcohol may or may not need to be mentioned as containing calories). It may be helpful to share a list of the basic categories of foods that contain carbohydrate, protein, and fat and work with clients to identify their typical food choices and how a significantly different eating plan will impact those choices. • Explain that foods aren't "carbs," but that some foods contain grams of carbohydrates. Note that by consuming very limited amounts of carbohydrate, they will consume more foods containing protein and potentially more foods containing fat, such as meats, cheese, nuts, and avocado, as well as foods that are predominantly fat, such as oils, butter, margarine, mayonnaise, and sour cream. Regardless of the percentage of calories one consumes from macronutrients, they will add up to 100%. • Focus on the quality of carbohydrate sources clients choose to consume. • Discuss how this eating plan may impact their enjoyment of food and socializing around food. Are they prepared to give up sweets, many starchy foods, dairy foods, and other foods to follow a very low-carbohydrate diet? • Ask clients about cultural foods, eating away from home, and other practices that may be impacted by this eating plan. Be supportive and help clients consider how this eating plan may work in their daily life. • Use visuals to help explain nutrition concepts. Work with clients to map out a few sample meals or a full-day eating plan based on their calorie and carbohydrate goals on a very low-carbohydrate eating plan so they can visualize what their plates may look like. This can help clients assess whether they can and want to follow this eating plan. • Discuss the practical aspects of sustaining this eating plan in their day-to-day lives. For example, ask how this eating plan will impact others in the household, and whether it will affect their social and/or religious life. • Explain the known progression of prediabetes to type 2 diabetes. Make this personal. Discuss where a client may be on this disease continuum and how this relates to the potential benefits or downsides of a very low-carbohydrate diet. • Assess their thoughts, feelings, and success with taking glucose-lowering medications. Ask the following questions: Do they dislike taking medications? Does taking them make them feel like they've failed at caring for their diabetes? Do they forget to take them? Do they have undesirable side effects? Is affording these medications challenging? Mention that there's the possibility that they may require less glucose-lowering medication when following a very low-carbohydrate diet. • Be open minded. Use a person-centered approach, nonjudgmental language, and shared decision making to help clients make decisions and set goals they embrace. • Use motivational interviewing techniques. Be inquisitive. • Employ experiential learning. Offer to show clients a sample eating plan. Ask whether they'd like to try it for a period of time and report back on how it's working for weight loss and glycemic management as well as fitting into their lifestyle.